Office Professional 2013 is designed to help you create and communicate faster with new, time-saving features and a clean, modern look. Plus, you can save your documents in the cloud on SkyDrive and access them virtually anywhere. 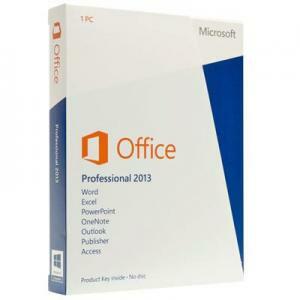 The latest versions of Word, Excel, PowerPoint, OneNote, Access and Publisher, plus Outlook on 1 PC. Experience Office at its best on Windows 8 devices, with an improved user interface optimised for touch, pen and keyboard. An improved look and feel reduces distractions for a better reading experience, while the new Start screen gives you a selection of recent documents and templates to get going quickly. Use OneNote to capture and share notes, pictures, web pages, voice memos and more. You can also allow others to scroll through your Word docs in a browser, even if they donâ€™t have word. Incorporate content from PDFs into word documents quickly and easily, and add pictures, videos or online media into a Word doc with a simple drop and drag. Enjoy the same great features you know and love with Office and get some new ones when you upgrade to Office 2013. Connect Outlook with Exchange ActiveSync, and youâ€™ll receive push-based email, appointments, and contacts via the most popular email servers and services. Continue to enjoy quick and convenient ways to open your email, calendar, contacts, and tasks. Get the very latest updates automatically from people in the social networks you rely on mostâ€”LinkedIn, Facebook, and others. Grab a quick glance at your schedule, an appointment, or details about someone youâ€™re emailingâ€”without having to rearrange windows or lose your train of thought. eamlessly integrate multiple contacts into a single view, while presenting social context and removing needless duplication. Reopen a document and keep reading right where you left off. Word remembers where you were--even when you reopen an online document from a different computer. Watch online videos right in Word, without having to leave the document, so you can stay focused on the content. Get a live preview as you resize and move photos and shapes in your document. The new alignment guides make it easy to line up charts, photos, and diagrams with your text. The new Excel gives you intuitive ways to explore your data. In one click, discover new ways to visualize your data, and see your information in new depths. Let Excel recommend the charts that best illustrate your dataâ€™s patterns. Quickly preview your chart and graph options, and then pick the ones that present your insights most clearly. The new Quick Analysis tool lets you convert your data into a chart or table in two steps or less. Preview your data with conditional formatting, sparklines, or charts, and make your choice stick in just one click. Flash Fill is like a data assistant that finishes your work for you. As soon as it detects what you want to do, Flash Fill enters the rest of your data in one fell swoop, following the pattern it recognizes in your data. In Excel 2013 each workbook has in its own window, making it easier to work on two workbooks at once. It also makes life easier when youâ€™re working on two monitors. To share part of your worksheet on the web, you can simply embed it on your web page. Other people can then work with the data in Excel Web App or open the embedded data in Excel. Stay organized with new behind-the-scenes tools, so you can keep your presentation focused and your audience tuned in. Direct your audienceâ€™s attention right to your point. Zoom in on a diagram, chart, or graphic with a couple of clicks, and zoom out just as smoothly. You and your colleagues can work together on the same presentation, either with the desktop or online versions of PowerPoint, and see each otherâ€™s changes. OneNote is your digital notebook that holds your notes, pictures, web pages, and media. Itâ€™s all saved and can travel with you via OneNote apps on your favorite devices or through your browser using the OneNote Web App. Your notes are always available when you use OneNote Mobile apps on Windows Phone, iOS, and Android phones. OneNote syncs with SkyDrive and SharePoint,* so your notes are always up to date on all your devices--automatically saved and searchable in the OneNote apps. Gather typed and handwritten notes, links, web pages, sketches, and videos and other media and assemble it in one handy place. Join online meetings and share your notes from any supported device, even if Office isnâ€™t installed. Create more sophisticated tables in your notes than ever before. OneNote now supports new formatting options for cell shading, header rows, and data sorting within table cells so you can organize and display information the way you want to. Publisher allows you to easily search online albums and store all your pictures in one place. Work with photo albums or documents using picture and text effects before printing or publishing. Along with the standard tools, Publisher 2013 comes with new ways to move, swap and publish your pictures. Search for pictures in one place, whether on the web, on your computer, or in the Office.com clip art gallery. Easily work with batches of photos and swap pictures quickly using the new scratch area. Save your publications and photos specially for photo centre or commercial printing. Each page can be saved as a JPEG file for efficient uploading to a photo printing website. Publisher 2013 comes with new picture and textual effects so you can add shadows, reflections, soft edges and more. Create professional-looking publications using built-in templates and enhance your documents with tile or full-page picture backgrounds. Create your custom apps quickly and easily with simplified navigation and new related data controls. Enjoy tracking tasks, finding data, and launching apps with the touch of an Action Bar button. Get more control over who can modify your apps with multi-user accessibility and advanced permissions controls from SharePoint. Find professional templates and tables for all your business needs and easily create new apps to track your data. Access 2013 stores your data in SQL for added reliability, security, and better performance. Import your data from Excel, SharePoint, ODBC, and legacy access databases for easy viewing and accessibility in a polished browser-based database app. Navigate views easily with simple switching between apps. Each built-in view has an Action Bar complete with buttons for adding, editing, saving, and deleting items. Once you've designed and created your app, save it as a package file then distribute it in the Office Store, or add it to your Corporate Catalog. A range of features to enhance your business tasks. Makes everything easier and more fluid, giving you a seamless working experience.